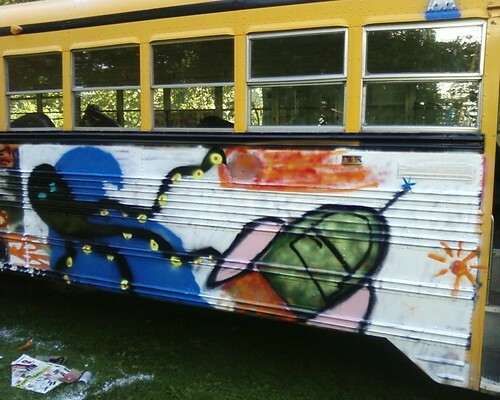 The bus has a fresh coat of ideas, and much of the painting was finished today. There are still some spots that need work, but thanks to all the folks who showed up today, Anne Marie looks great. Also, many thanks to Ashley and Tom who made the awesome mural above. There are loads of pictures on Flickr, from both Ned and myself. There’s also nearly an hour of video for me to edit, so at some point we will see something of that. 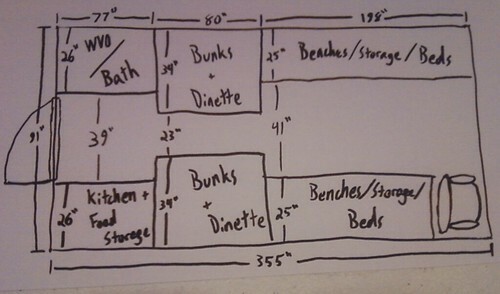 A basic floor plan I sketched up. I’ve been musing with a bunch of ideas for a while, and I think this is the most all-purpose plan. The backs of the benches can span across the walkway between the two to make decent sized beds. The dinettes will also fold down to create the bottom bunk. And the recliner will stretch out over the stairs when you recline. You can see the progress going from left to right. In the end, we managed to get all but five seats out. There are some other pictures up on Flickr, and we took some video of the whole process which will be up eventually. On Saturday I’m going to start taking the seats out of the bus. I have enough tools that a bunch of people could work on a couple seats at once. You’re welcome to come by and help. 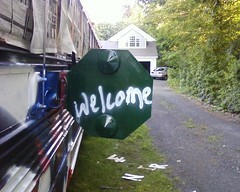 You’re also welcome to come by and not help, if that sounds more appealing. But we’ll probably guilt you into holding something, or turning the handcrank radio. Also, if you want a seat, come on by, and pick your own. I’m selling them for $10-$20 each, depending on the shape they’re in. This is going to be the primary source of funding for the bus for the first part of the summer. I’m working on whoring my body out to drug tests at UConn to pay for the second. Since all the work tomorrow will be either inside or under the bus, we can work comfortably rain or shine.